Hays, Kansas (July 27, 2016))—HaysMed will begin renovations of the Miller Pavilion in August. The project will broaden patient access to services and expand the surgical waiting area. The remodel is scheduled to be completed by June of 2017. The registration area will be relocated closer to the entrance and will result in five individual admissions offices. There will also be seven new financial counselor offices. The individual offices afford patients more privacy when checking in at the hospital and also access to financial counselors all in one area. A large surgical waiting area will be located east of the new admissions area featuring windows along the entire south side. The area will include large comfortable waiting chairs, a mini beverage dispenser area, vending machines, flat screen TVs, and an information desk. All electrical outlets will have USB ports with them to allow for phone charging. In addition two private consultation rooms will be available for families to privately talk with their physician. The biggest change will be the entry door to the pavilion. An automatic revolving door will be installed to provide easier access for patients and also help maintain climate control during hot and cold months. The information desk, manned by HaysMed Volunteers, will be moved closer to the entrance doors. This will allow for patients and visitors to ask questions and easily locate the service they are looking for. Another added feature will be the relocation and update of the Foundation Donor Wall. The Donor Wall recognizes friends and benefactors who have provided generous gifts as an investment in HaysMed to ensure quality healthcare for the people of Western Kansas. 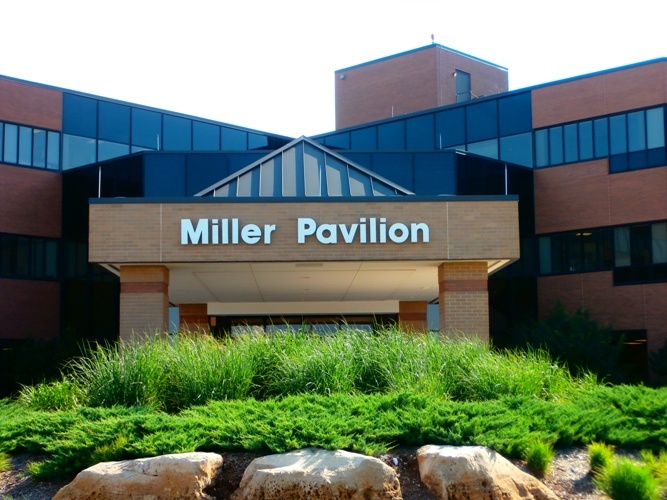 Entrance B at the Miller Medical Pavilion will remain open during the renovations and the information desk will remain. The drop off and valet parking will be available and Parking Lot B will remain open. The pharmacy has been relocated to the lower level of the Bickle Family Tower area and can be accessed through Entrance A.